Each road, side street, and highway in Tennessee poses a risk for certain kinds of crashes, and intersections are particularly deadly. As drivers approach an intersection, they may be struck by a speeding vehicle on their left or right side, injuring or killing the car’s occupants. According to the Insurance Institute for Highway Safety (IIHS), 3,933 people were killed in side-impact collisions in 2016, with one out of every three fatalities occurring as a result of a t-bone crash. Drivers should be aware of the causes of these crashes, as well as how to get proper compensation from a negligent driver. A side-impact collision occurs when the front of one car strikes the side of another at a right angle. These crashes are also called t-bone accidents (since the two vehicles form a T shape) or broadside crashes, and they are most likely to occur at intersections, in parking lots, and at entrances and exits from public areas. Improper left turns. 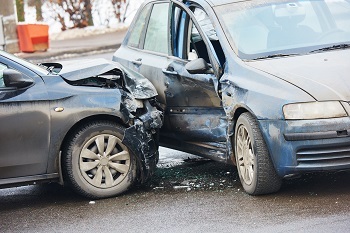 Side-impact crashes may occur as a driver turning left strikes the side of a motorist continuing straight through an intersection, or as a driver going straight strikes the side of a vehicle attempting to turn left. Rolling stops. Drivers are required to come to a complete stop behind the white line at a four-way intersection. Drivers who “roll” through a stop sign or creep into the intersection before they have the right of way may be found guilty of negligence, even if they are the ones who are struck by an oncoming car. Failure to follow traffic laws or signals. Broadside accidents may occur if two drivers reach an intersection simultaneously and neither yields to the other. In addition, drivers may be in dispute about who has the right of way, especially if the intersection is controlled by signals that allow turning at the driver’s discretion (such as a flashing yellow left turn). Running a red light. Drivers who fail to brake at yellow lights are placing everyone in the intersection at risk, especially if they increase their speed while approaching the intersection in order to “make” the light. Illegal and reckless behavior. Drivers may be unable to stop in time to obey traffic signals due to excessive speed, intoxication, drug use, drowsiness, or distraction from a cell phone call or text message. Vehicle defects. Defective auto parts may play a role in side-impact crashes if a driver’s brakes failed, her airbags did not deploy, her seatbelts unbuckled, or a sudden tire blowout forced her into another vehicle. Side-impact crashes are second only to head-on collisions in the number of car accident injuries they cause, for a variety of reasons. Firstly, the impact causes the occupants of the impacted vehicle to be thrown sideways, potentially forcing their heads into the car’s windows and doors. The sides of a vehicle are not as well-equipped to absorb the force as the front and back, and may not have airbags or structural supports to prevent harm to passengers. Another reason broadside crashes cause severe injuries is that the impacted vehicles are often pushed off the road or forced into a second collision with another vehicle. The force of the crash may spin the striking vehicle into the path of oncoming traffic, or force the car off the road and into a stationary object. Finally, the force of impact can cause the broadsided vehicle to roll over, placing the occupants at risk of head trauma, broken bones, and internal injuries. If you have been involved in a broadside collision, the attorneys at GriffithLaw can advise you on your legal options at no cost to you. In addition, our legal fees are paid with a portion of the settlement we secure for you, so you will not owe our firm anything until your case is resolved. Simply fill out the short contact form on this page to begin your car accident consultation, or request a free copy of our book, The 10 Worst Mistakes You Can Make With Your Tennessee Injury Case.